Some of my most beloved of favourite animals are our closest relatives the great apes. 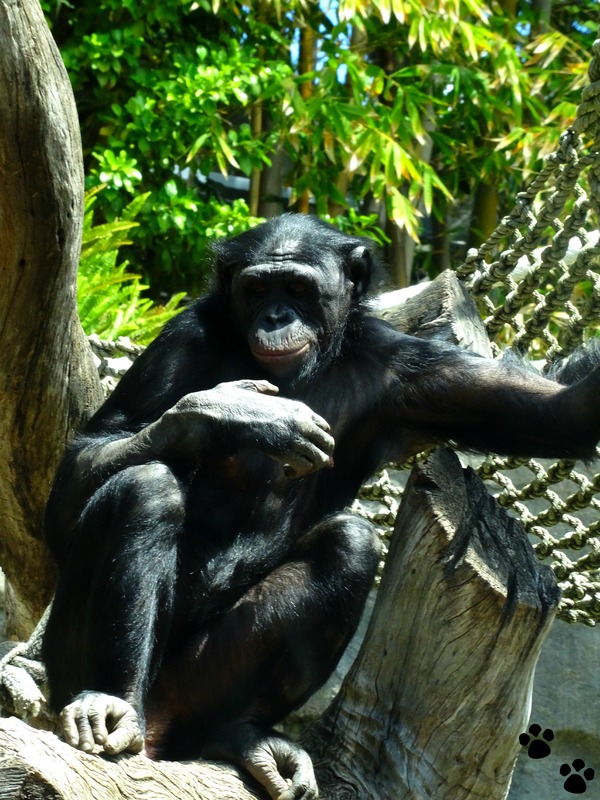 The San Diego Zoo’s great apes consist of bonobos, Western gorillas and Bornean orangutans. 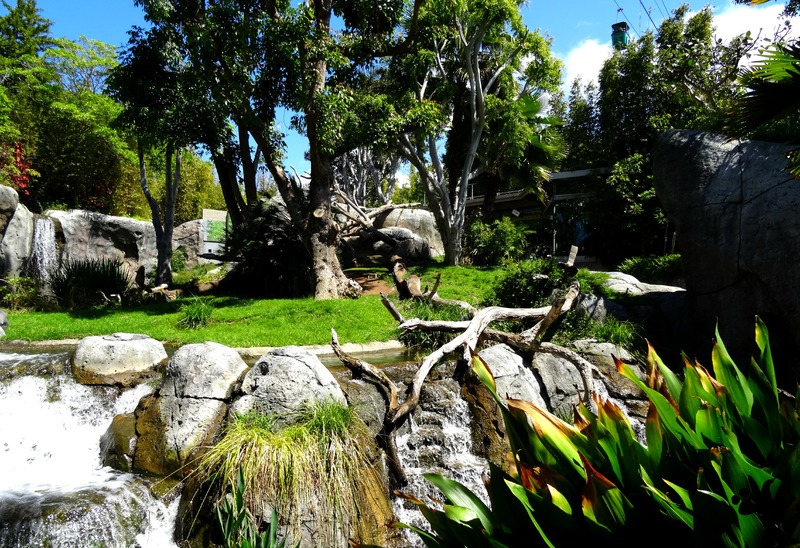 When visiting these amazing apes you’ll also find some of the San Diego Zoo’s finest and grandest exhibits. By far one of my favourite exhibits at the San Diego Zoo is Gorilla Tropics. Home to the zoos seven Western gorillas, Gorilla Tropics is 8,000 square feet of replicated central African rainforest with gorgeous waterfalls, a creek and meadow and tropic plants like allspice, coral trees and bamboo. The word ‘gorilla’ come from a Greek word meaning ‘tribe of hairy women’. 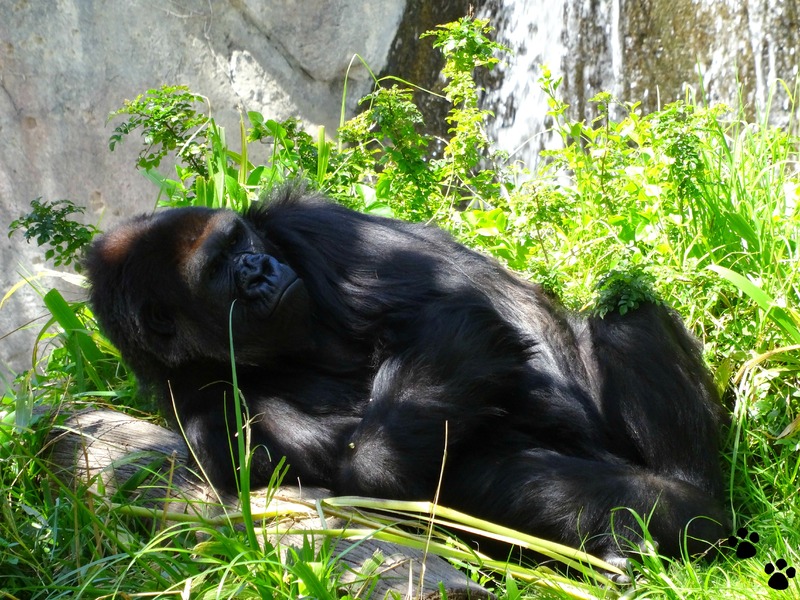 San Diego Zoo welcomed its first two gorillas in 1931 (you can learn more about Mbongo here). Today the zoos seven gorillas that make up two separate groups alternate their time on exhibit. On my visit they were mostly napping in the heat of the afternoon sun. Though this certainly didn’t diminish their brilliance to me, someone who has had a passion for gorillas since I first saw Gorillas in the Mist and learn of the great Dian Fossey. 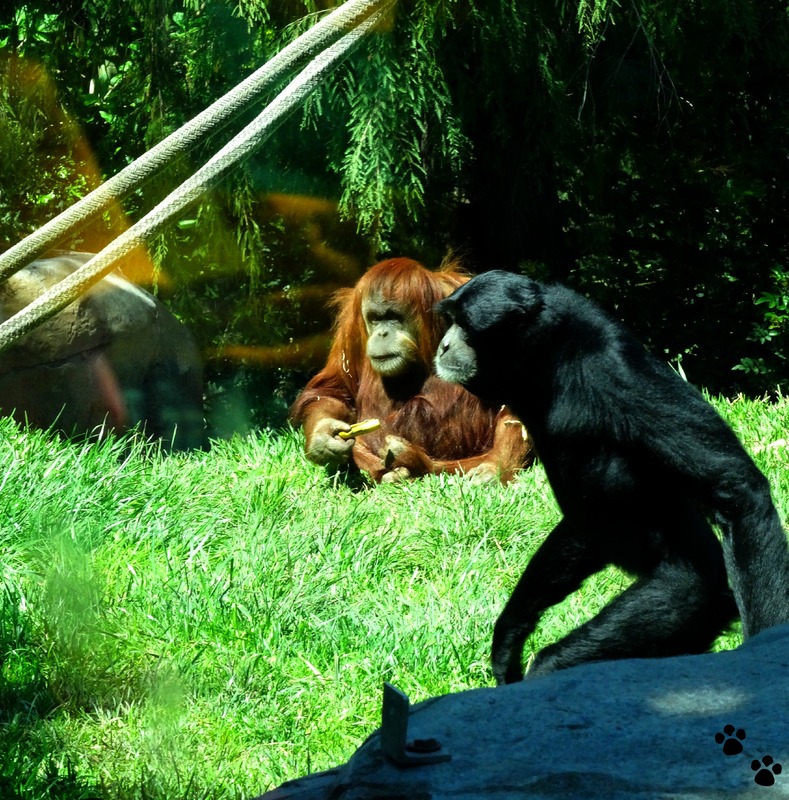 One of my 5 most memorable moments at the San Diego Zoo was at the bonobo exhibit. A lady was knelt down in front of the glass and a bonobo was on the other side, it was as if they were mimicking each others movements with hand gestures, kissing faces and with those deep, dark penetrating tender eyes looking out, I couldn’t help but feel as though I was interrupting an intimate moment, even with the crowd that had gathered. Considered to be the most endangered of the great apes, bonobos were once thought to be chimpanzees but are actually vastly different in size, behaviours and eating habits. Bonobos are smaller and much more relaxed than chimps and instead of resorting to violence they work out their differences with sexual displays. The San Diego Zoo was the first zoo in the US to welcome a baby bonobo and is now home to nine females and four males. The Absolutely Apes exhibit is absolutely amazing, with 8,400 square feet it is home to the zoos orangutans and siamangs (the largest of the gibbons), on exhibit together just as they would share the forests of Indonesia and Malaysia. The exhibit has a plethora of climbing structures and ropes and plenty of enrichment items like a man-made termite mound full of tasty treats and a 110 foot glass viewing window that seemed to be for the visitors just as much as it is for the orangutans to watch us. I could sit and watch these beautiful and intriguing animals all day, I loved how the male, sitting at the glass appeared to keep a watchful – yet dozy eye on visitors, while mother and 5-month-old baby Aisha slept in a hammock. But when a keeper came with treats they all sprang to action, heading over to her ready to indulge and funny enough it was the first I’d seen of the siamangs as they literally came walking, all gangly, quickly to get a piece of the action. 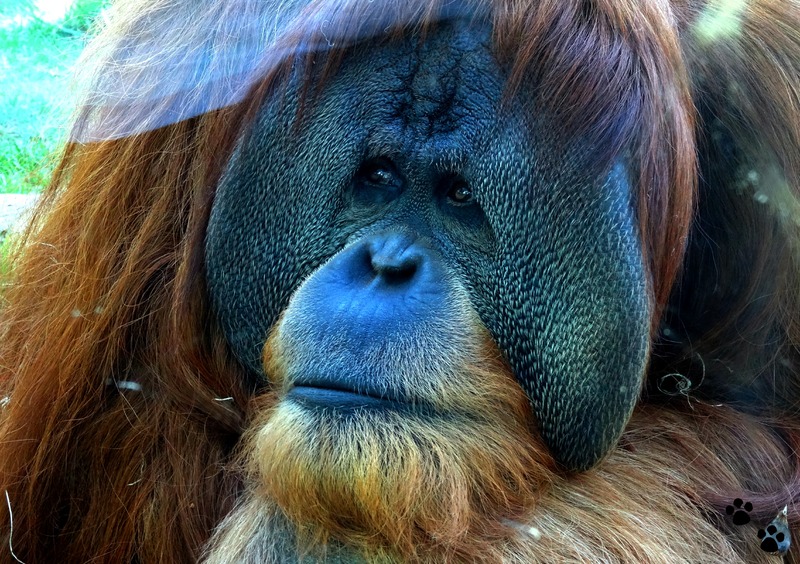 There was one particular orangutan that caught my attention and I started speaking with one of the San Diego Zoo’s amazing and passionate volunteers, Ruth. She introduced me to Karen who was spirited and full of character and had been hand raised at the zoo. Ruth told me about Karen and her open heart surgery (possibly the first on an orangutan) back in 1994 but you wouldn’t guess it now as she did somersaults and comically rolled her way over to the keeper for a treat. 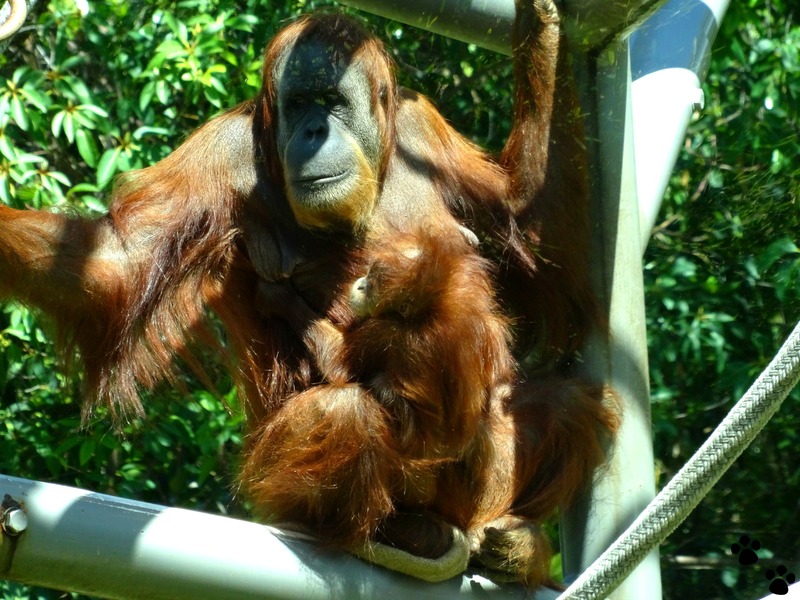 Ruth and I spoke of the importance of zoos and the education they bring to the public on why these majestic creatures are in peril, like the orangutans losing much of their habitat because its being destroyed for palm oil plantations. I’m always in awe of zoo volunteers who dedicate their time and love to zoos and their animals to help educate the public and encourage passion and desire to help. I, like many others, are drawn to these intelligent, gentle and amazing apes, perhaps we see a bit of our past in their eyes or maybe we see our future because if we can not save these amazing great apes how can we save ourselves.